Hello! My name is Kari Hendrickson and I am the new kid on the block for blogging. I am from Saugerties, NY but originally Puerto Rico. I am part of the class of 2018 and a social work major (a change since my first guest blog post on here). I love Saint Rose and can’t wait to share my experiences on here! 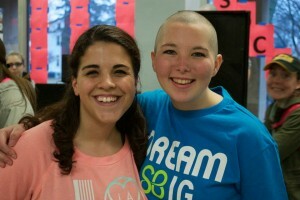 This past week was St. Baldrick’s Day at our College. People raise money for children with cancer and shave their heads to support them. It is a very inspiring charity that I fully support. I did not intend to shave my head that day. My two friends who are sophomores here did it last year, and I had talked to them about it. There was a part of me that wanted to, but I was nervous. On that day though, watching all these amazing people give up their hair to support children and people who don’t have that choice, I decided that I would shave my head too. It was one of the best things I have ever chosen to do. Not only am I helping support a cause I believe in, but it a new start for me. I feel very liberated bald, and I hope to convey the message that everyone is beautiful! We all go through tough times, and even if you are bald or have a physical disability, it does not decrease your value. We are all different on this plant, but that in itself is what makes us beautiful! 1) You will feel much colder. I mean much, much colder. 2) Your head is like velcro, your hats stick to your head, and trust me they are NOT going anywhere. 3) As someone who never owned hats, you will quickly learn that they are now your new best friend. 4) People will touch your head. It’s just a thing, you are like this cute little puppy that people can’t help but pet. 5) Showers take two seconds. No more hair = no more shampoo or conditioner. 6) Oh and no more hair brushes, hair ties, hair products, or anything that has the word hair in it. 7) People are very supportive and it’s great! 8) Getting ready is so easy. No need to wake up and try to work on that beehive on your head because…wait…you don’t have any hair! 9)You’ll see pictures of yourself with hair and magically start singing “I will always love you,” repeatedly. Or maybe that’s just me? 10) Over all, it’s a new experience and one you should be proud of! Shaving your head, especially for this cause, is such an empowering thing and you should always rock it, because we are ALL beautiful! Great job Kari, you are one special woman. Proud to know you kid. Deirdre is lucky to have you as a friend.